Home > Junior Mines > Balmoral Resources Ltd. The management team of Balmoral Resources has extensive experience in this world-class gold belt having most recently led West Timmins Mining Inc.. West Timmins was acquired, in a deal valued at $424 million, by Lake Shore Gold Inc. in 2009 following the discovery of the high-grade Thunder Creek deposit in Timmins, Ontario. 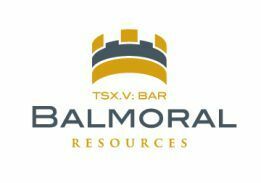 Utilizing that experience Balmoral has acquired one of the largest land positions in the Abitibi and now controls over 82 kilometres of the Sunday/Detour Lake deformation zone in the province of Quebec, Canada. The Sunday/Detour Lake deformation zone is one of the principal gold-bearing fault systems in the Abitibi greenstone belt and is home to the 18+ million ounce Detour Gold deposit. Well financed, with a solid resource base and district scale exploration opportunities in one of the richest gold belts in the world Balmoral has emerged as a significant new player in the gold exploration and development business. We invite our shareholders and potential investors to follow our progress by joining our email list or contacting us directly. With drilling underway on multiple fronts and aggressive growth/expansion plans we invite you to visit our website frequently for updates on our progress.